TAVISTOCK (NZ) (Bay 2005-Stud 2010). 6 wins-1 at 2, Waikato Draught Sprint, Gr.1. Champion Sire in Hong Kong in 2015-16. Sire of 225 rnrs, 145 wnrs, 17 SW, inc. Werther (HKJC Audemars Piguet Queen Elizabeth II Cup, Gr.1), Tarzino, Tavago, Volkstok'n'barrell, Tavidream - Circuit Glory (H.K. ), Hasselhoof, Hiflyer, Tomelilla, Gobstopper, Pacorus, Infantry, Avisto, Longchamp, Nymph Monte, Won Won Too, Tavy, Titanium, SP Milseain, Salsamor, etc. WARRIOR CODE, by Haradasun. Raced twice. Three-quarter-sister to Shirl Pegasus. Dam of one named foal. Magnapegasus. 2 wins at 1400m, 1600m in 2017-18, MRC (Mornington) Hoad Construction H.
The Cheetah. 2 wins at 1000m, 1100m to 2017-18, 3d ATC TAB H.
Magnus Rules. 2 wins at 1400m in 2017-18 in Aust. Whitewood. 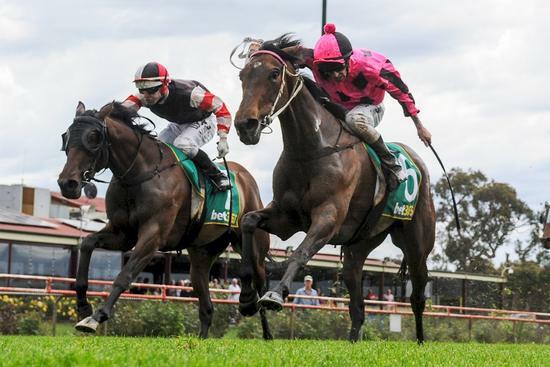 2 wins at 1500m, 2100m in Aust. Gorgeous Dancer. 5 wins to 1550m, SAJC Irish Day H., Legacy Tony's Tuna International H., 2d SAJC Walter Brooke Architects H., MRC Gipsy Queen H., 3d SAJC Prodec H., Leader Computers H. Producer. Night Rule (Shirley Heights). Placed. See above. BONNE DE FLEUR (Whittingham). 5 wins-2 at 2-at 5f, 6f, Ripon Silver Bowl S., L, 3d York Acorn Web Offset Nursery H.
SURE BLADE (Kris). 6 wins-3 at 2-from 5f to 1m, £140,167, Ascot Queen Elizabeth II S., Gr.2, Doncaster Champagne S., Gr.2, Royal Ascot St James's Palace S., Gr.2, Coventry S., Gr.3, 3d Newmarket Dewhurst S., Gr.1. Sire. SURE SHARP (Sharpen Up). 4 wins-1 at 2-from 1200m to 1800m in GB, Ireland and Italy, Newmarket Earl of Sefton S., Gr.3, 2d Curragh International S., Gr.2, Newcastle Beeswing S., Gr.3, Newmarket Craven S., Gr.3. ONLY A POUND (Sharpen Up). 7 wins from 1200m to 2000m in GB and South Africa, Vaal TAB Orange Free State H., L. Sire. SURE LOCKED (Lyphard). 2 wins at 1600m, Longchamp Prix de Bagatelle, L, 3d Grosser Preis der Landeshaupstadt Düsseldorf, Gr.2. Producer. LEIGH COURT (Grand Slam). Champion 3YO Filly in Canada in 2013. 9 wins from 5½f to 8½f, US$778,793, Keeneland Thoroughbred Club of America S., Gr.2, Woodbine Ontario Colleen S., Gr.3, Seaway S., Gr.3, Whimsical S., Gr.3, La Lorgnette S., L, Duchess S., L, 2d Presque Isle Downs Masters S., Gr.2, Woodbine Royal North S., Gr.3. KING OF SYDNEY (Diesis). 5 wins-1 at 2-from 1400m to 3400m, €135,820 in France and Germany, Düsseldorf Henkel Trophy, Gr.2, 2d Longchamp Prix de Conde, Gr.3, 3d Krefeld Grosser Preis der Krefelder Wirtschaft, Gr.3, 4th Milan Premio Vittorio di Capua, Gr.1. BARRACKS ROAD (Elusive Quality). 3 wins at 6f, 1m, US$369,645, Woodbine Ontario Colleen S., L, Ontario Damsel S., L.
BASHFUL (Brief Truce). 3 wins-2 at 2-to 1450m, Vichy Prix des Jouvenceaux et Jouvencelles, L, 3d Deauville Prix du Calvados, Gr.3. Producer. HEART OF FIRE - GREAT HEART (H.K.) (Mujadil). 2 wins at 2, €125,279, HK$246,500, Cork Rochestown S., L, Leopardstown Irish Stallion Farms 2YO S.
FREEDOM (Hurricane Run). 2 wins at 1¼m, 10¾f, Dundalk Diamond S., Gr.3, Curragh Kilsaran International S., 3d Leopardstown Kilternan S., Gr.3, Listowel S., L.
PALLODIO (Medecis). 6 wins-1 at 2-from 1400m to 2000m, £10,770, €191,590, La Coupe de Maisons-Laffitte, Gr.3, Cagnes-sur-Mer Grand Prix de la Riviera Cote d'Azur, L, 3d Longchamp Prix Ganay, Gr.1, Lingfield Winter Derby, Gr.3. Sire. OPTIONS OPEN (Then Again). 6 wins-2 at 2, £121,879 in GB and Sweden, Taby Open Sprint Championship, L, 3d Munich Grosser Buchmacher Springer Sprint Preis, L.
HIDDEN CREEK (Mummy's Game). 4 wins-3 at 2-at 1000m, 1200m in GB and Italy, Rome Premio Aniene, L, 2d Milan Premio Primi Passi, Gr.3. DORDOGNE (Singspiel). 4 wins-1 at 2-from 1800m to 2300m, £58,012, €115,000 in GB and Turkey, Lingfield Derby Trial S., Gr.3, Istanbul Anatolia Trophy, L, Newmarket Feilden S., L, Goodwood RH Hall 2YO S.